I'm so proud of my friend Chef Richard Miller of Graze in Winston-Salem for winning the Triad's Got to Be NC Competition Dining Series! The featured ingredients were Joyce Farms Poulet Rouge, Poulet Rouge Eggs and Barbee Farms Peaches. Chef Miller took the title, a handmade chef knife by Ironman Forge, $2,000 and the "Red Chef Jacket." He and his team also get to compete in the state finals this fall! Chef Miller defeated Chef Dion Sprenkle (of Chef Dion Sprenkle in Lexington), which was by no means an easy feat. I dined at two battles in which Chef Sprenkle competed, and he was quite the powerhouse in the kitchen. Chef Miller had an agenda though, as he was runner up to Chef Tim Thompson of Marisol last year. That makes this year's victory even sweeter. I've had a fantastic time collaborating with Got to Be NC Competition Dining Series, one of my favorite events all year. I'm looking forward to reading about their expansion into Greenville, SC coming up next! You can read the official press release below! 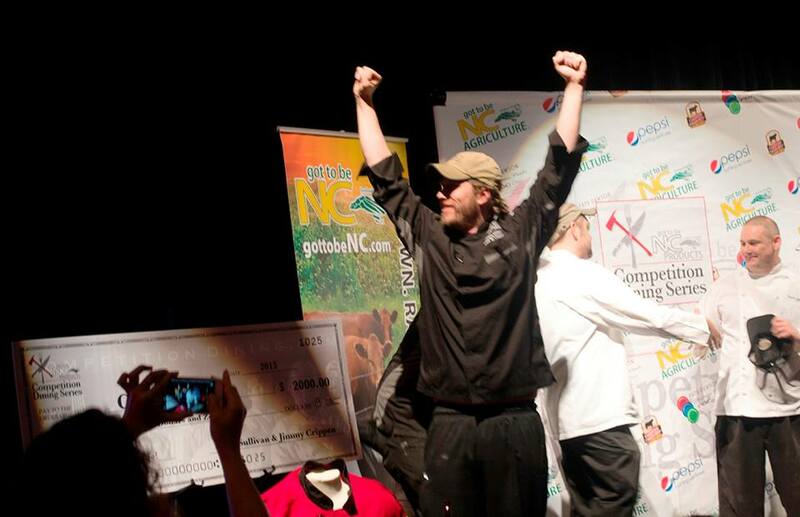 Winston-Salem, North Carolina – The Got to Be NC Competition Dining Series, a single-elimination tournament highlighting the best of the state’s food, agriculture and culinary talent, has named a regional winner for the Triad series. Chef Richard Miller of Graze in Winston-Salem took home the title last night in the battle of chicken, eggs and peaches. Miller defeated Dion Sprenkle of Chef Dion Sprenkle in Lexington in the final dinner competition after rising to the top of the 16-chef regional tournament that started back in May. As part of his regional championship winnings, Miller took home a $2,000 cash prize, a handmade chef knife by Ironman Forge and the coveted “Red Chef Jacket” provided by ALSCO. Additionally, the Graze team, which also includes Tim Gallione and Kevin Woods, moves on to the final battle of champions in October where they will compete against the winners from the Triangle, Charlotte and first-ever South Carolina series – which kicks off in Greenville next month. In every Got to Be NC Competition Dining Series dinner event, two chef teams battle it out preparing three courses each centered on a featured regional ingredient that is revealed before they start cooking that day. Ticketed dinner guests savor a full-service, six-course meal without knowing which chef prepared which dishes. Unlike any other cooking competition, attendees vote on each course using a free app, and ultimately help determine who moves on to the next battle round and who goes home. The Got to Be NC Competition Dining Series now moves on to Greenville with battles starting Aug. 3. Additional information and ticket reservations are available at www.competitiondining.com. The Got to Be NC Competition Dining Series has hosted annual chef tournaments throughout North Carolina for years with the goal of celebrating local products and agriculture, and showcasing the culinary ingenuity and talent across the state. It is sponsored by the NC Department of Agriculture & Consumer Services, Pate Dawson-Southern Foods, Certified Angus Beef®, Pepsi Bottling Ventures, ALSCO, NC Egg Association, Hits Technology and Joyce Farms. For the first time ever, Competition Dining will expand outside North Carolina in 2015 with a new series in Greenville, South Carolina. For more information, visit www.competitiondining.com or get in on the conversation at www.facebook.com/competitiondining and @CompDiningNC on Twitter or Instagram.